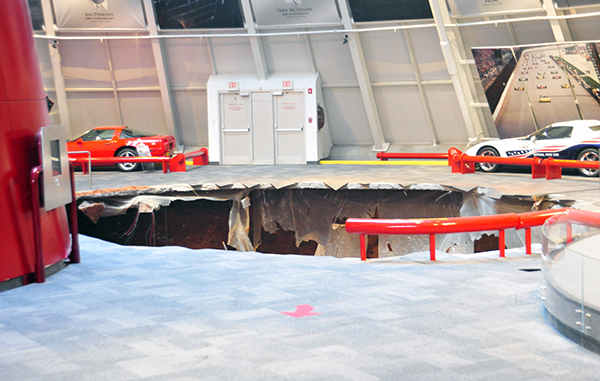 A sinkhole reportedly opened up inside the National Corvette Museum in Bowling Green, KY at around 5:44AM local time, swallowing eight vintage Corvettes that were on display. The sinkhole is reportedly about 40 feet wide and at least 25 feet deep. No one has been hurt. The Bowling Green fire department was on the scene right away and geologists from Western Kentucky University have been called to investigate. Much of the western Kentucky region is underlain by karst, limestone that has been eroded to produce springs, sinking streams, caves, and sinkholes. The sinkhole occurred in the museum's Sky Dome, a yellow cone-shaped dome 140 feet in diameter with a nearly 100-foot high glass ceiling. Cars in this area are rotated, as they are in the rest of the museum. No one is being allowed into the Sky Dome, but the rest of the museum initially remained open before reportedly closing later in the morning so an engineer could assess damages. The damaged cars include a 1993 ZR-1 Spyder and a 2009 ZR-1 "Blue Devil" both on loan from General Motors; the Blue Devil was so named for the alma mater of then-GM CEO Rick Wagoner, Duke, as company staff tried to sway him to approve the ultra-high performance model. Also damaged were a 1962 Black Corvette, 1984 PPG Pace Car, 1993 Ruby Red 40th Anniversary Corvette, and 2001 Mallett Hammer Z06 Corvette, all owned by the museum, as well as the 1 millionth Corvette produced from 1992 and the 1.5 millionth from 2009. Staff removed one car, an irreplaceable 1983 Corvette, but are leaving the other cars in the Sky Dome until the structure has been assessed. Corvettes, which are made by General Motors, are assembled in Bowling Green.